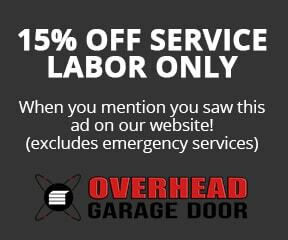 Deerfield Garage Door Repair and Installation | Overhead Garage Door Inc. Overhead Garage Door has been providing garage door repairs in Deerfield since it was founded in 1981. When you’re trusting a company with your home, it’s imperative you go with a licensed, bonded and insured organization. Too many Deerfield providers are working without proper license and insurance policies. Overhead Garage door however, maintains an A+ Rating with the Better Business Bureau and is an Angie’s List Super Service Award Winner. Our Angie’s List profile has over 350 reviews. Overhead Garage Door has a commitment to it’s Deerfield customers and Lake Country residents. As a family-owned and operated business, we maintain the highest level of service. Overhead Garage Door is current members of the International Door Association and Central States Door Dealers Association. With over 35 years experience we can handle any of your garage door installation or garage door repair needs in Deerfield. Finally, a company you can trust. My opener wasn’t working, I called and told them to just come and replace it with a new one. I really didn’t even ask for a price, just didn’t want to leave my car out in the snow one more night and have to dig it out. Turns out, it was just a mouse that ate through a wire and the entire repair was 85.00 verses the many hundreds they ball parked. Everything works as good as new and 6 more inches are predicted tonight! After 35 years of business, our mission remains the same; to provide our customers with the highest quality products and service in the industry. We are a family business that cares about your family! Call our Deerfield Garage Door Repair team anytime! Overhead Garage Door’s dispatch team is available 24/7 in Deerfield. We will provide you with a free estimate and emergency services. We provide garage door installations and garage door repairs throughout all of Deerfield and surrounding communities.